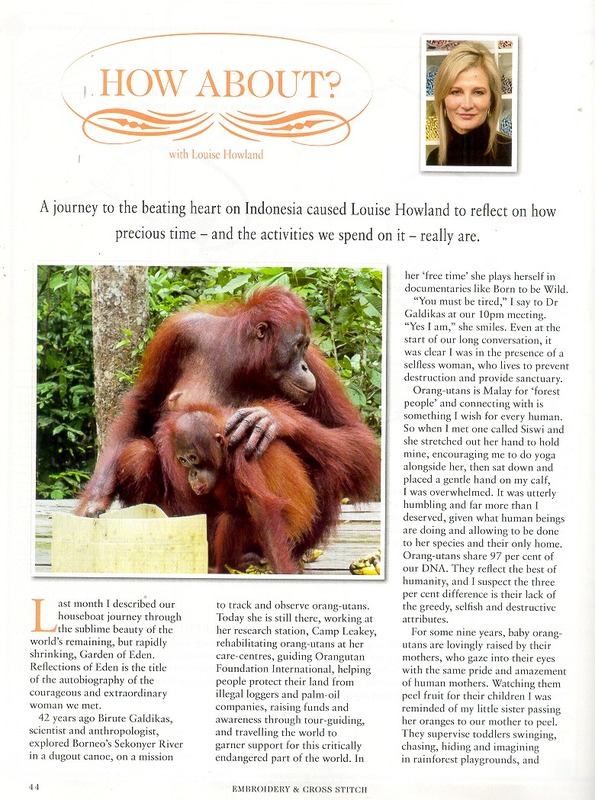 Magazine Articles written by Louise. 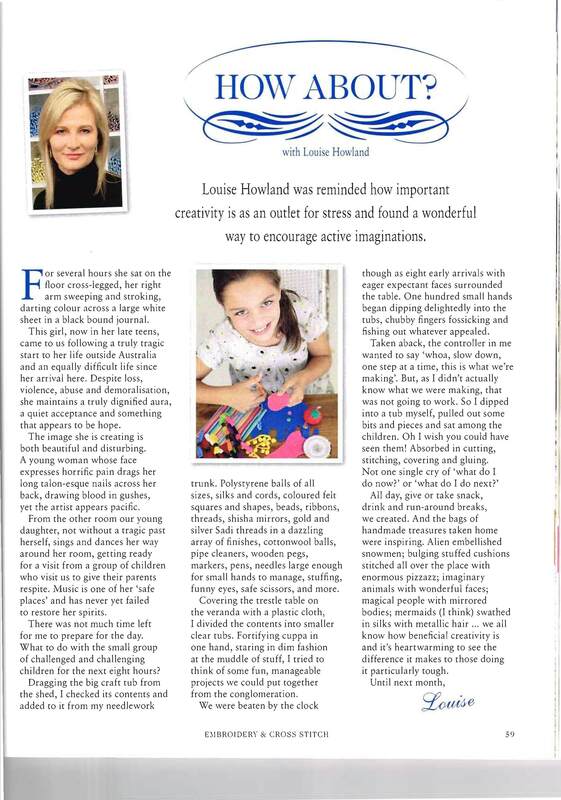 Louise Howland was reminded how important creativity is. 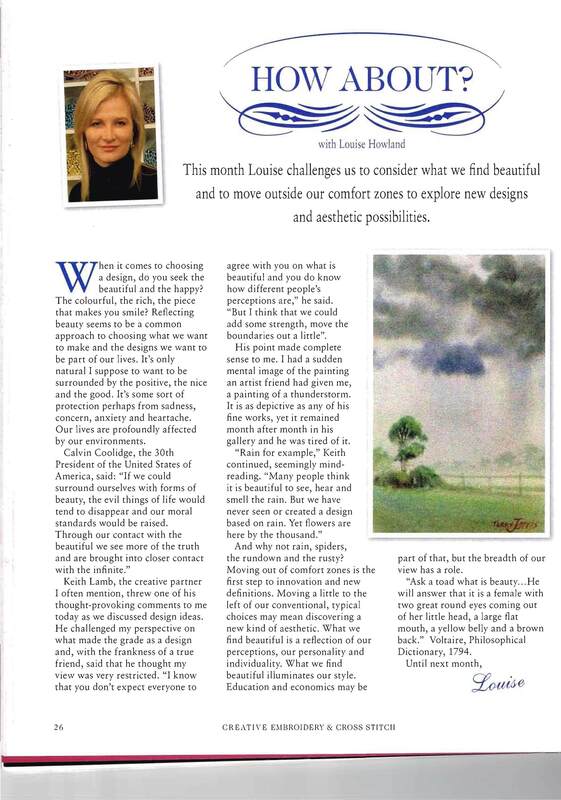 This month Louise challenges us to consider what we find beautiful. 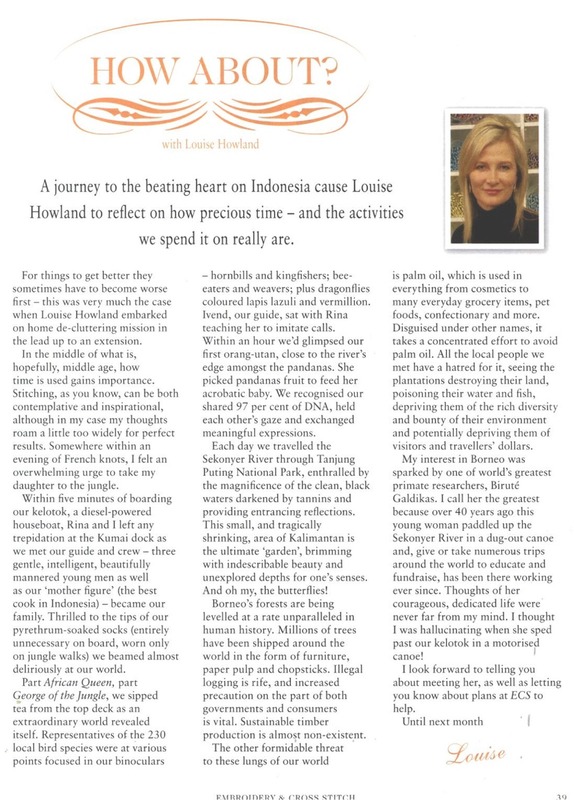 This month Louise considers how we percieve the world. 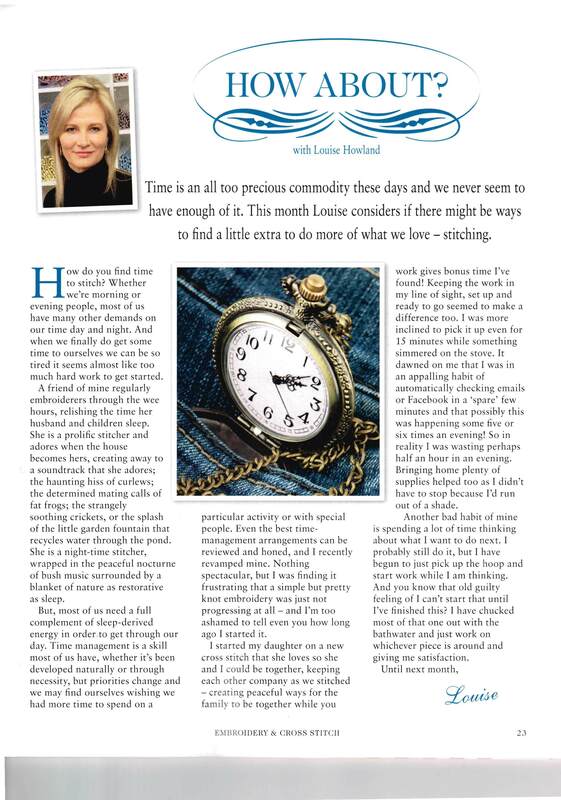 This month Louise unravels the threads of history. 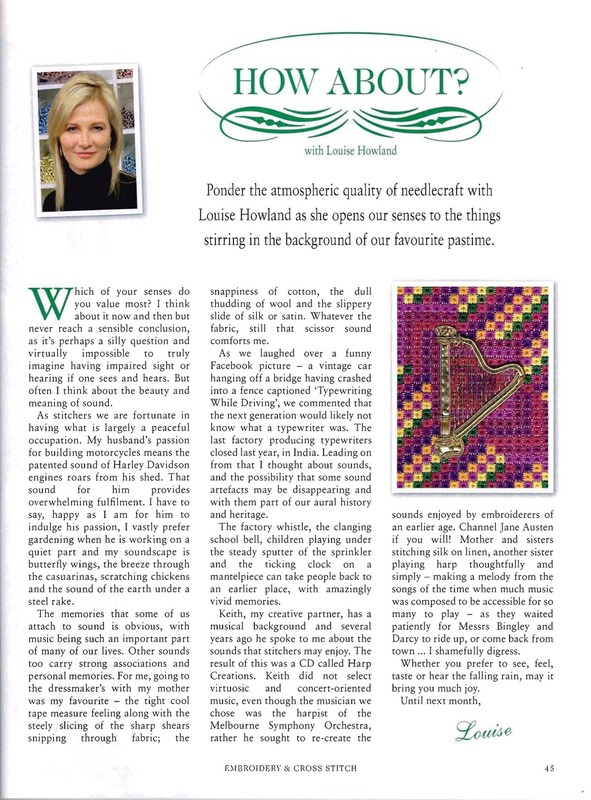 Ponder the atmospheric quality of needlework. A Journey to the Beating Heart. For things to get better they sometimes have to get worse first. The efficiency and ease of internet shopping proved a shining beacon in the lead-up to Christmas, but alas - all was not as it seemed! What does the concept of work mean to you? Is it merely a means to an end, or a wonderful opportunity to find happiness. Without a doubt, the only people who truly appreciate the time and dedication that goes into a single perfect stitch are fellow stitchers themselves. An old basket of fabric scraps is a link to another time and a foreign country, as well as the source of precious memories recalled. Do you feel an affinity for places other than your home patch? In the midst of a wonderfu experience, it's not often we fear it may be the last time for us. 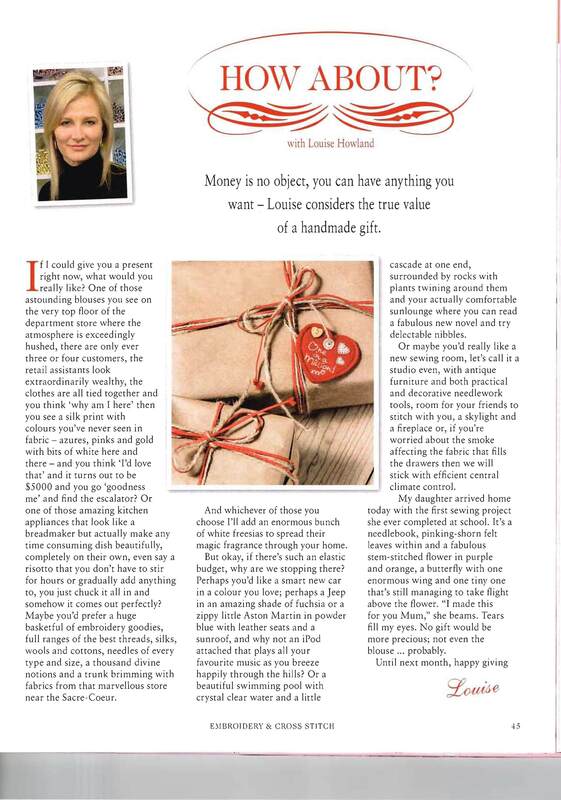 This month, Louise considers the expert status achieved through specialisation versus the pleasure of variation. 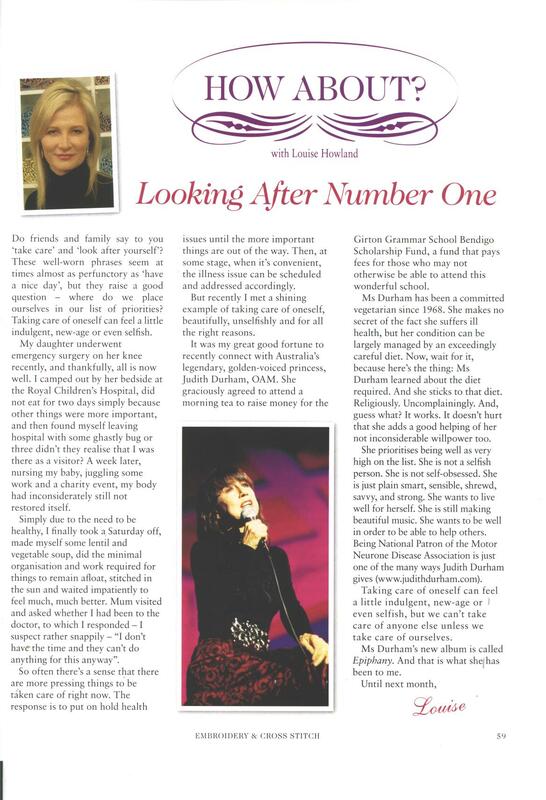 This month, Louise finds hidden pleasures to buy, admire and eat in beautiful English country town. 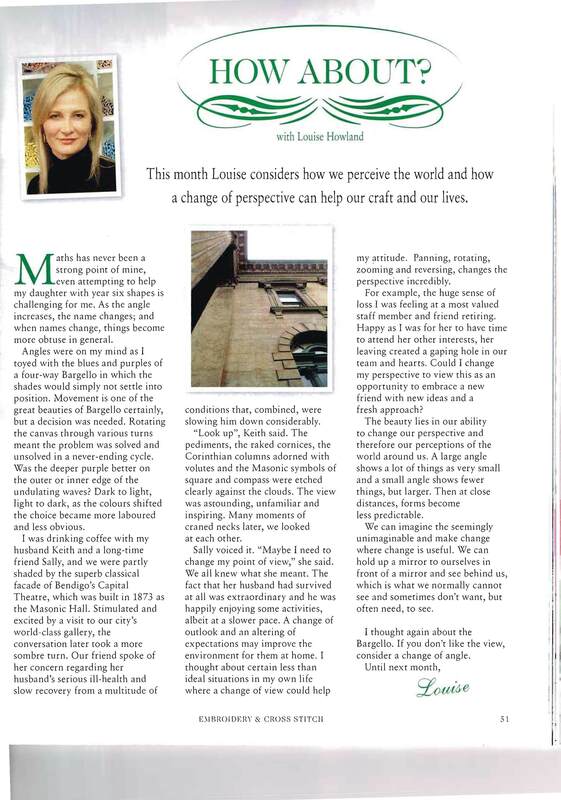 A chance meeting with a stranger gives Louise some perspective, propelling her day in another direction entirely. 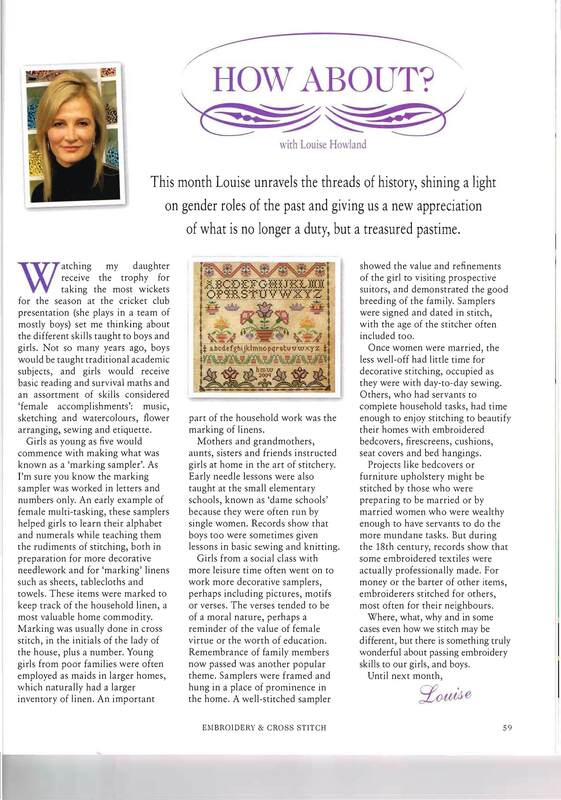 The art of Needlework dates from the earliest record of the world's history, and has, also, from time immemorial been the support, comfort and employment of women of every rank and age. 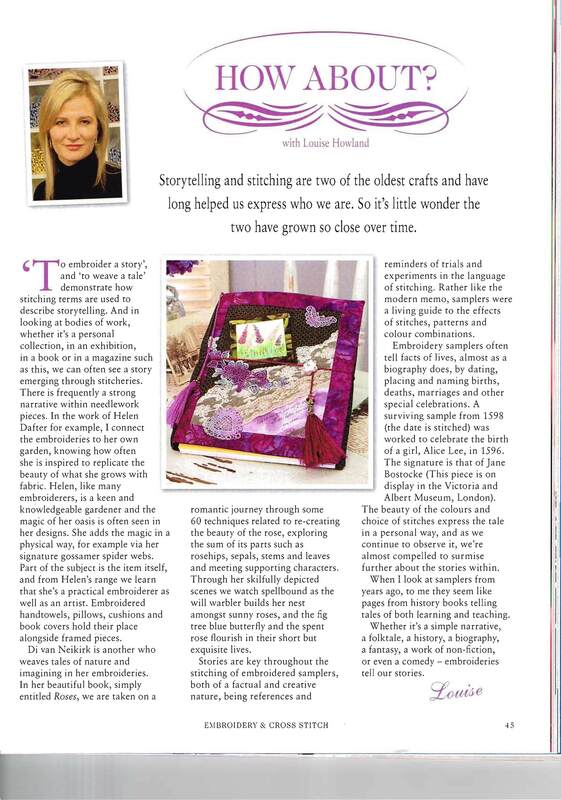 I asked an embroiderer, whose beautiful stitching often graces the pages of this magazine, how she satin-stitched so well. "It's very simple", she told me with a smile. "If a stitch looks . 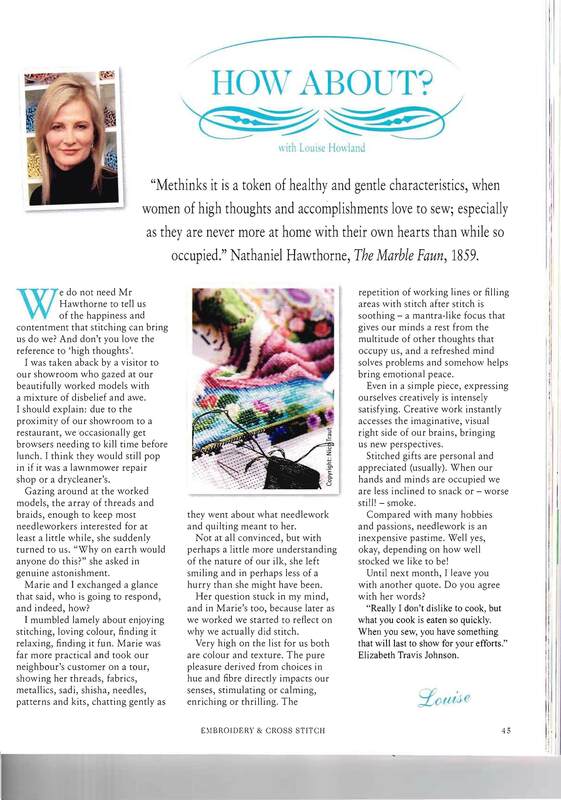 . .
Take a deep breath and travel out of your comfort zone this month - the end result may be a revelation! So many inspiring ideas are contained within these covers that I am . 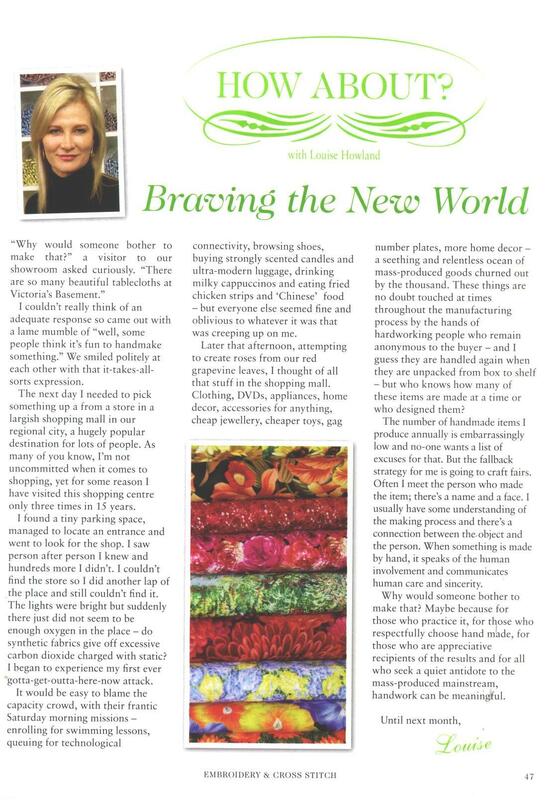 . .
Are there any of us who haven't stitched a flower of some kind, whatever the style? My first attempt at embroidery was a whipped running stitch pony on purple linen . . .